After collaborating with Droid brothers Raiz back in 2012, Jeff Derringer returns to Electric Deluxe with his first solo effort for the label – a solid two-tracker of rigorous dancefloor material we’ve come to expect from the Chicago resident. Behind the decks, Jeff Derringer is a name well known as founder and visionary of the renowned Oktave parties in the US. And in recent years he has built up a solid discography to match. An impressive debut on New York-based label Subtrak back in 2010 caused Perc’s Ali Wells to sit up and take notice. A trio of Perc Trax releases quickly followed, laying the foundations for Jeff’s dark and hypnotic style of techno that has since been picked up by labels M_Rec Recordings and Prosthetic Pressings. 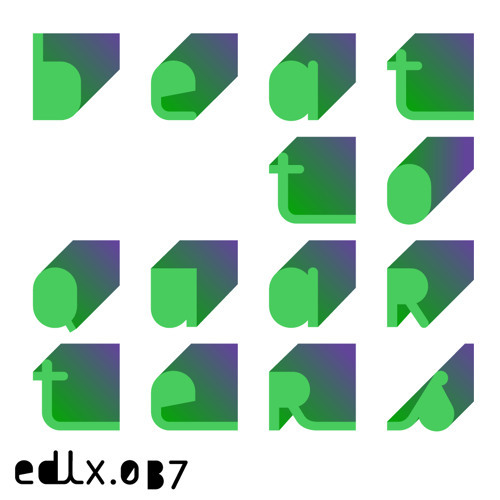 Jeff’s last work with Raiz for EDLX, ‘Deception EP’, was merciless, robust and went straight in for the kill. And his solo effort, 'Beat to Quarters', is no different. Title track opens with spitting hats and chugging intent before space-blips, ticks and typical Derringer-charged atmospherics storm in. EDLX mainstay Giorgio Gigli then ups the ante on his “Variation” with swirling foreboding strings and muted mutant clicks, turning “Beat To Quarters” into a menacing 8 minute-long epic. Then on the flip, Jeff goes in weirder with “The Stranger”. Full of itchy claps, crashes and deep space tones there’s plenty here to keep you busy. The EP concludes with a cool and creeping remix from Voices From the Lake – their first outing on the label. Voices From the Lake is of course Donato Dozzy and Neel’s much-celebrated experimental project. It’s with great pleasure we welcome them aboard.